The FairPay Zone: Paywall 2.0 ...and Paywall 3.0 -- Focus on the Customer! Recent presentations by Zuora, the champion of The Subscription Economy, and its president Tien Tzuo, describe "Paywall 2.0," as "why focusing on customers is the only way to win" in a blog at The Guardian, "The Reinvention of Media" on Slideshare, and "The Future of Publishing" in a longer white paper. There is also a 20 minute video. This as an excellent foundation for what I see as the next step, FairPay, which I am suggesting as Paywall 3.0. Zuora is right about Paywall 2.0, and FairPay builds on that to deepen -- and center on -- the customer relationship. I firmly believe we live in a world where success is not about how many products you ship. It's about how strong your customer relationships are, and how well you are monetising those relationships. As described in this blog and related Web site, FairPay reinvents the architecture of digital commerce to focus completely on the customer relationship. It does this by shifting from a short-term transaction view of pricing to a long-term relationship view, and empowering the customer to engage in meaningful "dialogs about value." 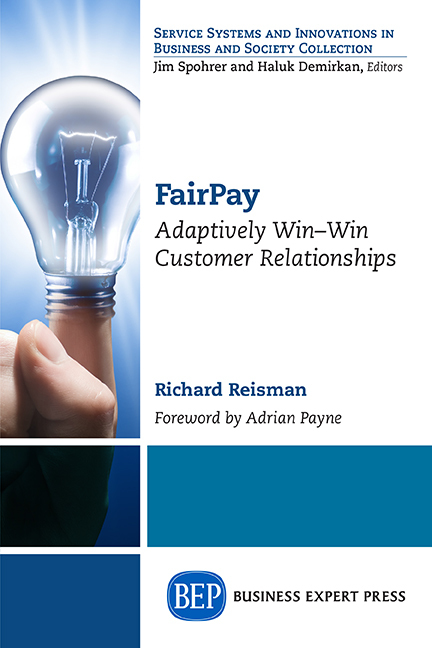 It is this FairPay dialog that generates the price, with deep participation by the customer. 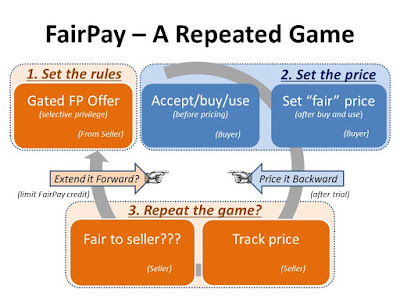 FairPay works as an adaptive value discovery engine that sets the price -- and how the product is offered to the customer -- to match what the individual customer wants and values. Zuora rightly focuses on the many challenging aspects of subscription operations and how to build a business around ongoing subscriptions. FairPay is fully consistent with that. In fact Zuora has expressed an interest in adding FairPay into their offering, as an alternative approach to pricing that their clients can apply as an option. FairPay can be viewed simply as just another pricing model that Zuora's subscription services can offer (one based on pricing and payments in arrears, with a decision process for renewals based on user pricing behavior). That is fine, but consider how FairPay points to deeper strategic opportunities. We shifted about a century ago from negotiated (participatory) prices to seller-imposed prices that enabled efficient mass marketing, but distanced the seller from the consumer. The costs of that have been lack of knowledge of the customer and lack of loyalty from the customer that have been hard to compensate for (such as with remedial market research and loyalty programs). Now the new phenomena of digital products and networks have disrupted commerce again, with movements to free, "freemium," and even "pay what you want" and "name your own price." Businesses have found it challenging to adjust to this, and no current models really do the job well (most obviously in information and content industries). The Subscription Economy can help (as for Netflix and Pandora), but getting consumers to pay for information and services that obviously have near-zero marginal cost remains very problematic (and relationships are critical, as Tien had previously observed with regard to Netflix's serious pricing missteps). the business continues to permit FairPay transactions/renewals as long as they agree that consumer is "fair" about the price (in their individual context). 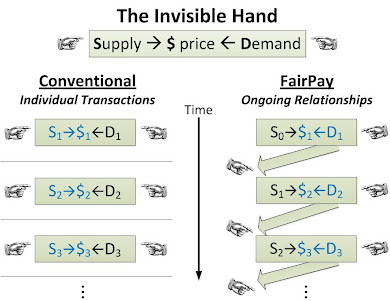 FairPay participatory processes can bring in far more customers (over a wide range of price points), increase profits (by capturing more latent value), and empower win-win relationships based on fair value exchange. Think of a privilege that is earned and maintained - a zone of pricing freedom, a "FairPay Zone." Much like custom negotiation (but with important differences), this participatory process can also be far more economically efficient than set prices, by including flexible consideration of all relevant dimensions of value, usage, context, ability to pay, etc. As noted above, Zuora has expressed an interest in adding FairPay into their offering, as an alternative approach to pricing that their clients can apply as an option. Building a FairPay offering to customers on a strong infrastructure base like Zuora's makes a great deal of sense.